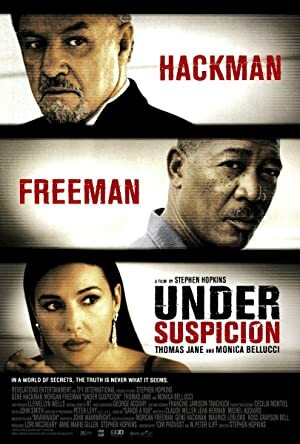 Under Suspicion (2000) – What's New on Netflix Canada Today! While San Juan celebrates San Sebastian’s Feast, recently-divorced and world-weary police captain Victor Benezet calls in prominent attorney Henry Hearst to clarify his statement about discovering the body of a girl of about 12, the second such murder in two weeks. As Hearst answers unconvincingly, Benezet reveals circumstantial evidence: the lawyer is under suspicion. The interrogation strips away Hearst’s dignity, public persona, and even his toupee, exposing a breech with his beautiful and much younger wife, questionable sexual predilections and a damning hobby. Then, Hearst’s wife volunteers information that confirms police suspicions. Is Hearst finally at the breaking point?